If you’ve ever been at a business or family function and the situation called for saying something nice about someone who clearly didn’t earn it, you know just how President Donald Trump must’ve felt last week when he was asked to comment on North Korean dictator Kim Jong Un’s complicity in the untimely death of American college student (and hostage) Otto Warmbier two years ago. For those who need a refresher, North Korea detained Warmbier in 2016 for allegedly trying to smuggle a poster out of the communist country. He was subsequently “convicted” and sentenced to hard labor and subjected to barbaric treatment that left him in a coma. Otto died shortly after being returned to the U.S. He never regained consciousness. Given Warmbier’s age and good state of health prior to his treatment at the hands of his North Korean captors it’s obvious something beyond bad happened to him during the year he was in custody. And seeing as Kim Jong Un presides over his populace like a cat watching a mouse hole, any reasonable person would surmise he not only knew about Warmbier’s situation, he also likely had everything to do with the student’s demise. Yet Trump indicated otherwise the other day. Brett Samuels reported at The Hill, “President Trump took heat from both sides of the aisle on Thursday for saying he trusts that Kim Jong Un was not responsible for the death of Otto Warmbier, an American college student who died after being imprisoned in North Korea. Reaction to Trump’s wishy-washy explanation was swift and negative from just about everyone. What else is there to say? Here in the United States it’s common knowledge Kim Jong Un is a heartlessly savage human being who’s put members of his own family to death. Trump knows it too. He’s no doubt heard the reports and testimonials of witnesses to Kim’s vicious atrocities. The man’s not dumb…it’s not like the president plans to ask Jong Un to be his best man if he ever decides to renew his wedding vows with Melania. At the same time, the international balance of power is at stake and Trump is attempting to accomplish something historic, namely talking and cajoling Kim into giving up his nuclear weapons that not only threaten the U.S. and its allies in Asia, he’s also hoping to establish a new precedent for future diplomacy that if successful could save thousands, hundreds of thousands or even millions of lives. Duh. I suppose if Menendez were in the president’s chair opposite Kim he’d have invited the leftist dictator to a posh Caribbean resort to feast on underaged prostitutes, but that’s another story. The ethics rules are always different where Democrats are concerned -- why even bother asking them for a statement? The fact is, sometimes we must make nice with an “enemy” to achieve meaningful progress in an endeavor. Ask a policeman if he’s ever talked with gang members or other community thugs he knows are less than reputable -- or informants with long records of criminal complicity -- and the lawman will tell you it’s a vitally necessary part of doing the work of catching perpetrators. Likewise, in wartime you forge relationships with people you’d just as soon shoot as break bread with. Anything less than victory is a poor alternative. It’s not hard to understand. The old saying goes, “The enemy of my enemy is my friend.” It’s true. Richard Nixon went to China in 1972 to alter the Cold War balance of power. Nixon knew the Soviets wouldn’t look kindly at friendly U.S. relations with China -- and he was right. At the same time, it’s highly doubtful Nixon traveled there thinking Chinese leaders would abandon communism or human rights abuses to smoke a peace pipe with the Americans. Ditto for Ronald Reagan in the eighties. The same American leader who’d labeled the Soviet Union the “Evil Empire” a few years prior quickly became cordial with Mikhail Gorbachev. The world saw Gorbachev as a magical mystical enlightened reformer but people in the know (i.e., those who got out of Russia at the time) would tell you the Soviet Premier was a determined communist like all the rest of them. Nevertheless, Reagan met with Gorbachev on several occasions and the two men forged what appeared to be a respectful, mutual friendship. And the world became a better, safer place. Is what Trump’s doing with Kim really so different? 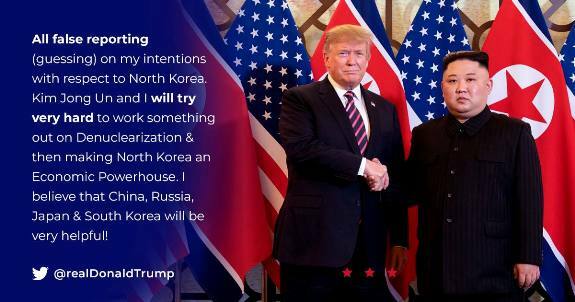 The purists -- the president’s Democrat opposition, neoconservative #NeverTrumpers and sad to say, some conservatives -- would prefer the president poke his fingers in Kim’s eyes, stomp out of the room and refuse to return the NORK ruler’s texts and phone calls… but would this really advance the cause of peace? Then there’s Speaker Nancy Pelosi who, true to form, found fault with Trump’s final summit results. Susan Ferrechio reported at The Washington Examiner, “Speaker Nancy Pelosi said North Korean leader Kim Jong Un was the ‘big winner’ in the Vietnam summit with President Trump that tried but failed to reach a denuclearization deal. To her credit, San Fran Nan did commend Trump for not ending the economic sanctions in exchange for Kim’s puny offer to slightly reduce his nuclear arsenal. Saying anything nice about Trump must send chills up the Democrat maven’s spine. It doesn’t happen often. Critics are a dime a dozen and unless you’ve walked in Trump’s shoes in dealing with Kim, there’s no telling who “won” or “lost” last week. The status quo remains in place and it never hurts to talk face-to-face no matter what the opposition believes. Let the naysayers chirp.